The food was so good, we all went back for seconds and thirds. Back in August, we hosted an intimate dinner party at our studio to pre-game for issue #14 (available here). We started the evening sipping on punch made with Tokki Soju. The soju punch was fun and limey and very refreshing paired with the richness of dinner. 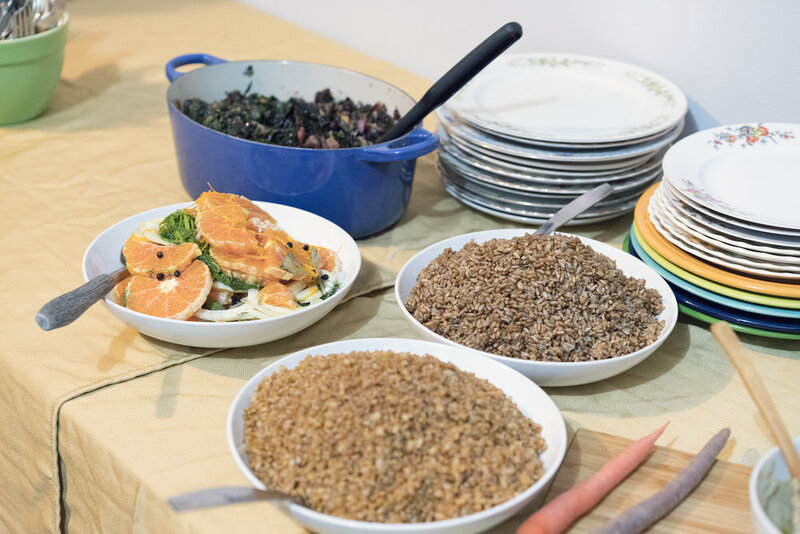 With twenty or so of our best friends and supporters, we feasted on feijoada comprised of bacon, jowl, ears, trotter, sausage, and tails sourced from Fleishers; cooked for 7 hours with Grow NYC Jacob’s cattle beans. We chose this dish because it can feed so many people with ‘bad cuts’ or meats that are usually thrown away. It was ceremonious, lifting the lid of the pot and releasing the heavenly pork smell into the air. Some of the side dishes - local NY state grains and veggies. Sides of New York regional einkorn and rye berries soaked up all that fatty, porky goodness. We also had rainbow chard sautéed with garlic supplied by Local Roots NYC. Instead of traditional orange slices to balance our Brazilian fare, I served marinated tangerines with fennel and rice vinegar. For good measure, and to make sure vegetarians didn’t pass out, we cracked a few sous vide eggs over brothy beans— because why not? In the hubbub, we forgot the farofa! Next time, we shall not forget the farofa. Don’t forget to buy the latest issue of Put a Egg On It. Speaking of new issues, you’re invited to our spring celebration AND 10 year anniversary party on May 19th. Save the date and RSVP to our event on Facebook here. In a large pot, sauté the onion on medium heat in the oil until they are translucent. Add the garlic and bay leaf and cook for a minute. Add the meats and cover with water. Bring the whole thing to a boil and then reduce back down to medium-low heat to simmer. Keep a cracked lid on top for two hours, the beans should be cooked through and the meats falling off the bone. 1 lbs einkorn or rye berries or both! Can be prepared ahead the night before. Bring the broth to a boil. Add the grains, reduce the heat to a simmer and cover for 20 minutes. Stir it once and check for doneness. Continue cooking with the lid off until they are tender. Drain and cool before storing in the fridge. These can be prepared ahead. Peel and slice the tangerines into rounds. Shave the fennel thinly with a mandoline and toss with the tangerine. Drizzle the olive oil and vinegar over it. Cover and set aside for later. Sauté the garlic on medium heat until they turn golden brown, add the chard and toss for two minutes until they wilt. Transfer to a bowl and set aside. Serve heaping spoonfuls of feijoada over the grains and a side of greens in a bowl. Snack on the tangerines during or after to cleanse your palate.